My dried beets tasted great (see yesterday’s post) except they were a little too tough for snacking. I am not deterred. I read a recipe this summer that I have been wanting to try so my beets will be a great start to the preparations. The recipe is for a salad topping of dried and crushed vegetables. 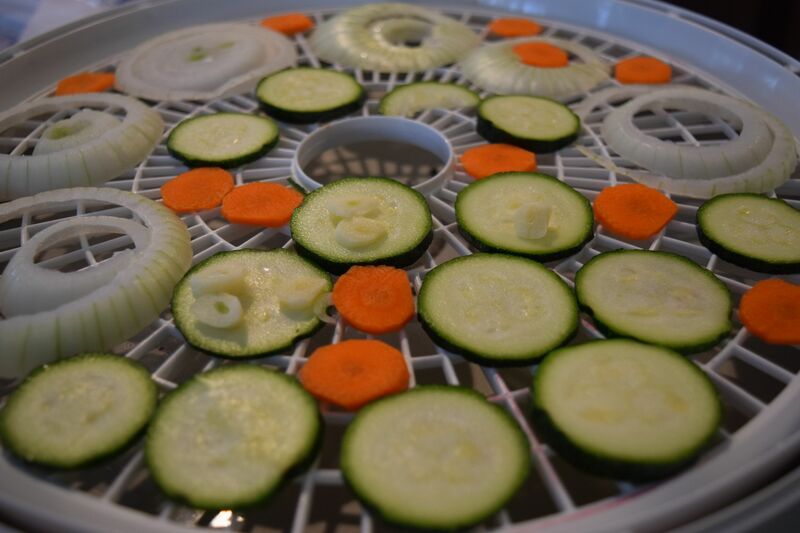 I loaded the dehydrator today with some carrots, onions, garlic, and zucchini. I’m going to dry them, chop them in the food processor, and add some sunflower seeds and other goodies to make a salad shake topping. You will have to stay tuned one more day to see the outcome. 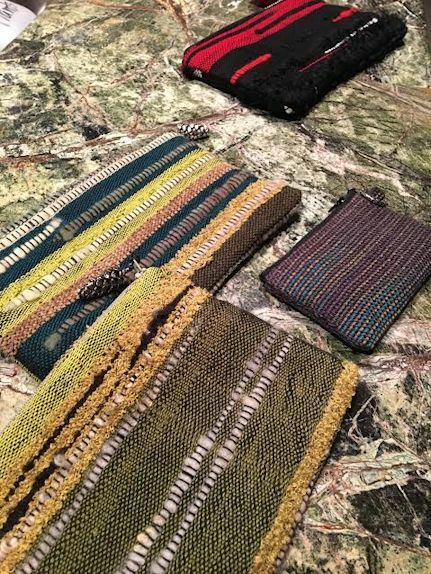 Speaking of tomorrow, I will have a drawing for a hand-woven, hand-sewn zippered pouch from my weaving lessons. Subscribe to the blog by tomorrow at 5:00 p.m. to be included in the drawing. I will let the winner choose the size of the bag and I have two choices for the fabric. Good luck! I don’t know about you, but I am often asked to bring food for a snack table at work and I often try to use this as an opportunity to try out a new recipe. Anonymity on a carry-in table has its benefits. If the food tastes good I can claim it and reap the compliments. If the new recipe I tried tastes bad, I can act like I agree and tell people to avoid that dish (with an appropriate yuck face) because it’s awful. One tip is to always bring your food in a disposable container. That way if it’s bad, your name isn’t plastered all over the dish. Would I ever do anything that underhanded and dastardly. You bet I would. School is a dog eat dog world and only the toughest can survive. I remember one year when I was teaching at a middle school, we had a particularly grumpy cafeteria lady. At that time, I was still drinking iced tea (I don’t anymore), and my teaching partner and I would often walk back to our room with our plastic tea glasses in hand to finish our beverage leisurely in class (like there’s anything leisure about middle school.) Well, this little habit made the cafeteria lady CRAZY. She wanted those glasses back in the cafeteria so she could run them through the steamy Hobart each and every day so they could stick together in wet stacks to be pried apart and used again the next day. Of course we did not always comply and every so often we would even take a cafeteria tray back to our rooms and eat in our classrooms. Twenty minutes of near silence was golden. When we returned to the cafeteria and turned in our trays, we were met with increasing glares. We soon became afraid of the GCL (grumpy cafeteria lady) and so we would wimp out and send our trays or cups back to the cafeteria by way of students, who were always excited to escape from any classroom. Soon, the GCL started asking whose dishes these were and the terrified student who had come from my partner’s room naturally said my teaching partner’s name. When the student reported the horrifying ordeal of the tray delivery, it of course cracked me up because I was able to escape the GCL’s wrath in easy fashion. Brilliant! The moral of this story…always pull a random student from the hall or from someone else’s class to do your dirty work. Your reputation will remain intact and you will be allowed to live to eat the “delicious” cafeteria food another day. Today, however, I have made an kitchen craft that precludes me from pulling these little shenanigans at the goody table, in the cafeteria, or elsewhere. I made an etched casserole dish with my name on the bottom. Perfect for potlucks when you are confident in your recipe and don’t mind telling the world of your culinary prowess. Bad, if you care to hide your identity. 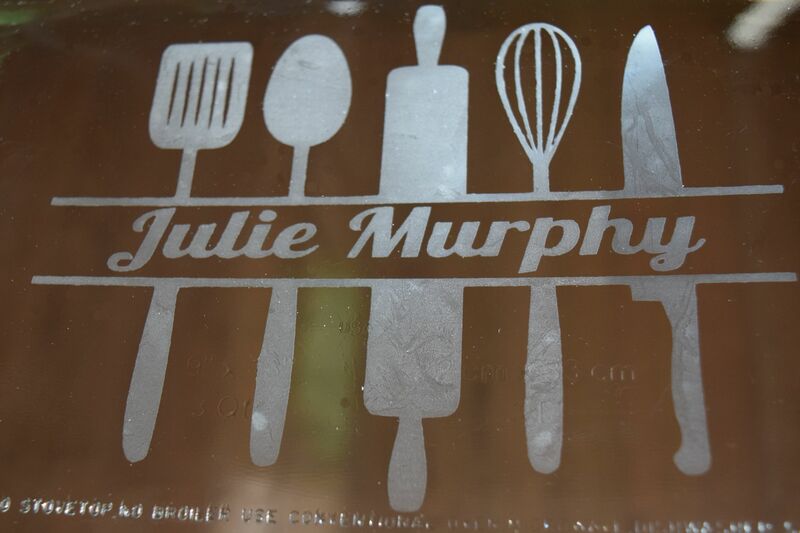 This craft is super easy other than having to be careful with the etching cream for the glass. The cream is highly caustic and toxic. WEAR GLOVES AND A MASK. First, make or order a reverse stencil of what you want to say on your casserole. I ordered mine on Etsy from the seller ARTISAN GLASS STENCILS. 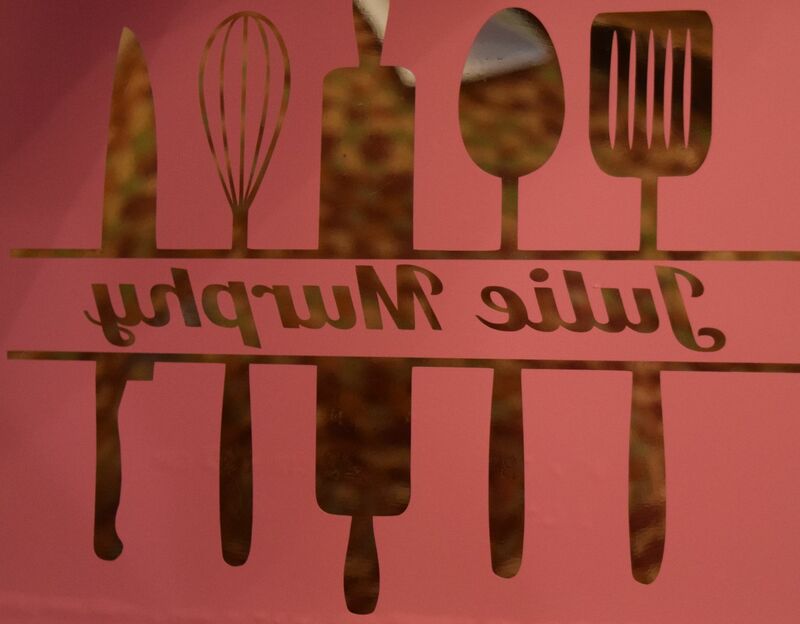 The lady’s name is Mary (tell them FranklySouthern sent you) and she is lightning fast getting your stencils to you. My stencil was about $7.00 but she has a variety of stencils and price points. 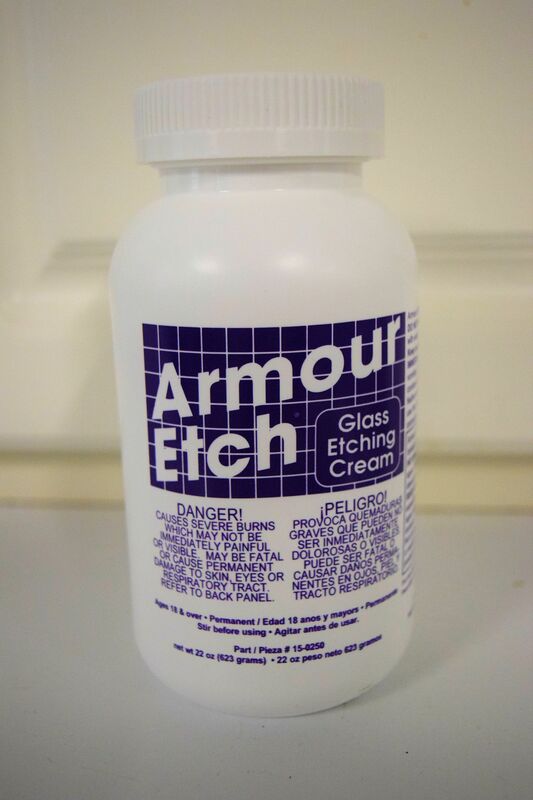 Next, purchase a glass casserole dish (Walmart about $5.00) and some etching cream (Michael’s about $8 to $40 depending on the size of the jar. Use your coupons!). 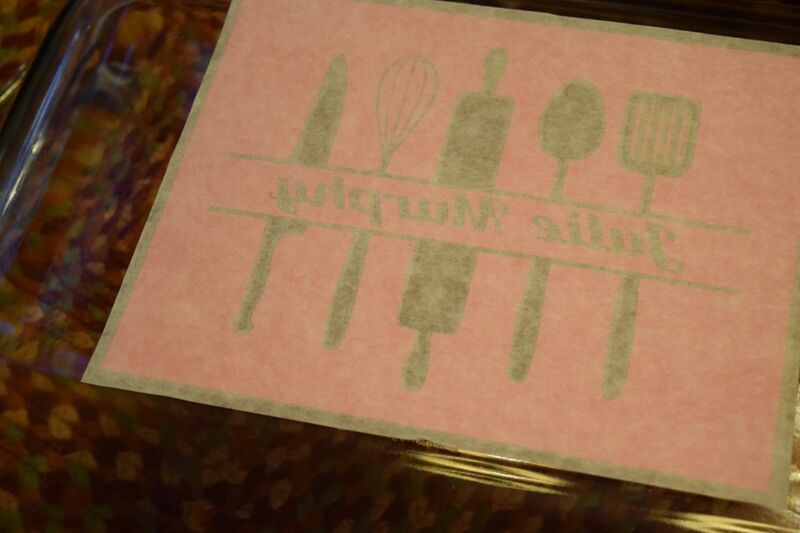 Place your stencil on the bottom of the casserole dish and peel off the backing. Use blue painter’s tape to tape off the sides and edges of the casserole dish so you don’t accidentally get etching cream anywhere but on the stencil openings. Put on your gloves and mask and use a popsicle stick to spread on an even layer of etching cream. Set a timer every 10 minutes and swirl the etching cream around a bit on the casserole dish. The crystals in the cream can etch unevenly if you don’t keep moving them around. After 45 minutes scrape the cream back into the jar. Rinse the dish with cold water and you have a personalized casserole masterpiece. See you tomorrow when I reveal my salad toppings and the winner of the woven zippered pouch! Love the casserole dish! Still not sold on the beets! Yuck! I love, love your glass etching idea…as for the dried vegies, I do not have a “contraption” to try this out…but the idea of using them on salads is absolutely great–especially for diabetics.